Download "Fees & Commissions. A. Fees. A.1. 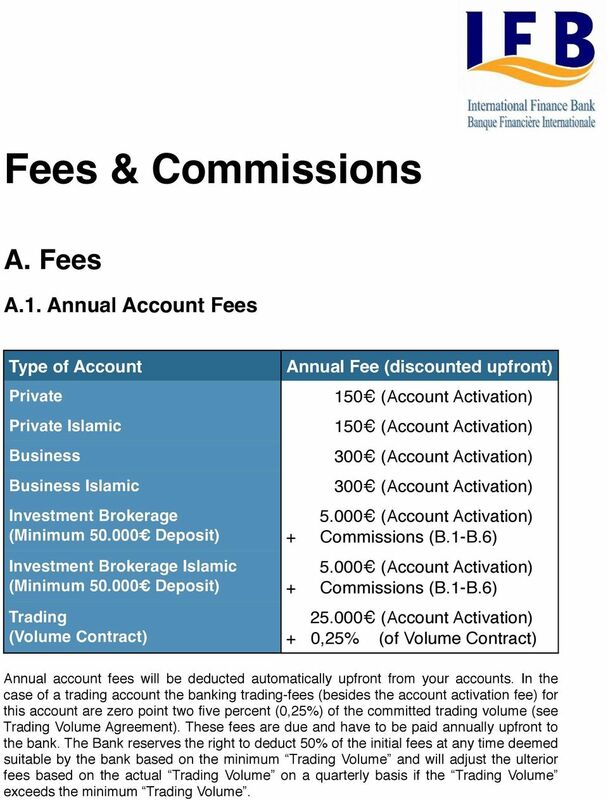 Annual Account Fees"
3 A.3. 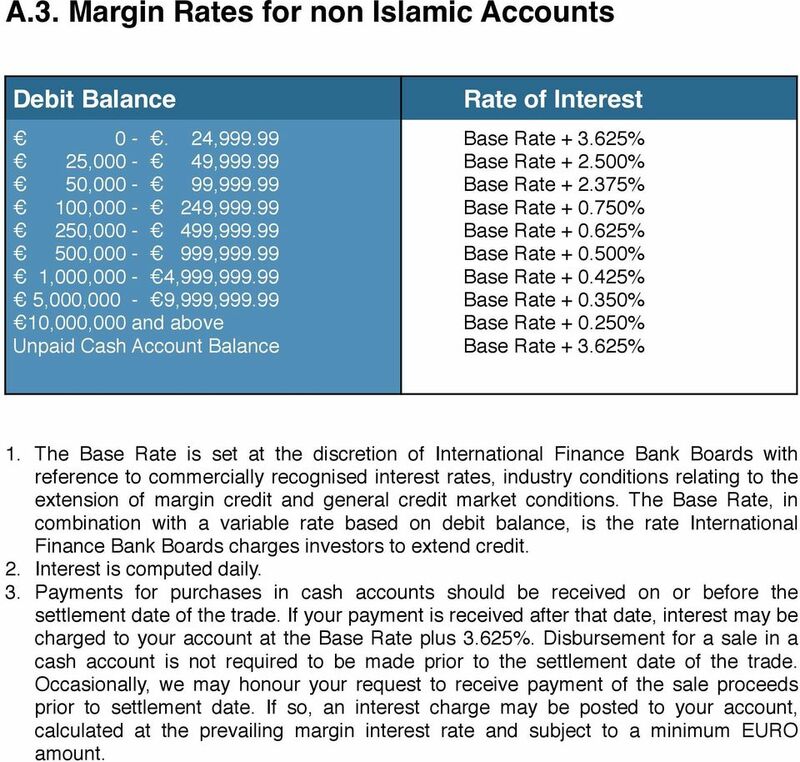 Margin Rates for non Islamic Accounts Debit Balance Rate of Interest , ,000-49, ,000-99, , , , , , , ,000,000-4,999, ,000,000-9,999, ,000,000 and above Unpaid Cash Account Balance Base Rate % Base Rate % Base Rate % Base Rate % Base Rate % Base Rate % Base Rate % Base Rate % Base Rate % Base Rate % 1. The Base Rate is set at the discretion of International Finance Bank Boards with reference to commercially recognised interest rates, industry conditions relating to the extension of margin credit and general credit market conditions. The Base Rate, in combination with a variable rate based on debit balance, is the rate International Finance Bank Boards charges investors to extend credit. 2. Interest is computed daily. 3. Payments for purchases in cash accounts should be received on or before the settlement date of the trade. If your payment is received after that date, interest may be charged to your account at the Base Rate plus 3.625%. Disbursement for a sale in a cash account is not required to be made prior to the settlement date of the trade. Occasionally, we may honour your request to receive payment of the sale proceeds prior to settlement date. If so, an interest charge may be posted to your account, calculated at the prevailing margin interest rate and subject to a minimum EURO amount. 4 B. s B.1 Stocks and Exchange Traded Funds (ETFs) Excluding Penny Stocks The PMA Package is subject to a 30 monthly service fee. Online / Automated Telephone Trading B.2 Penny Stocks (Stocks priced less than /$1.00/share) The PMA Package is subject to a 30 monthly service fee. 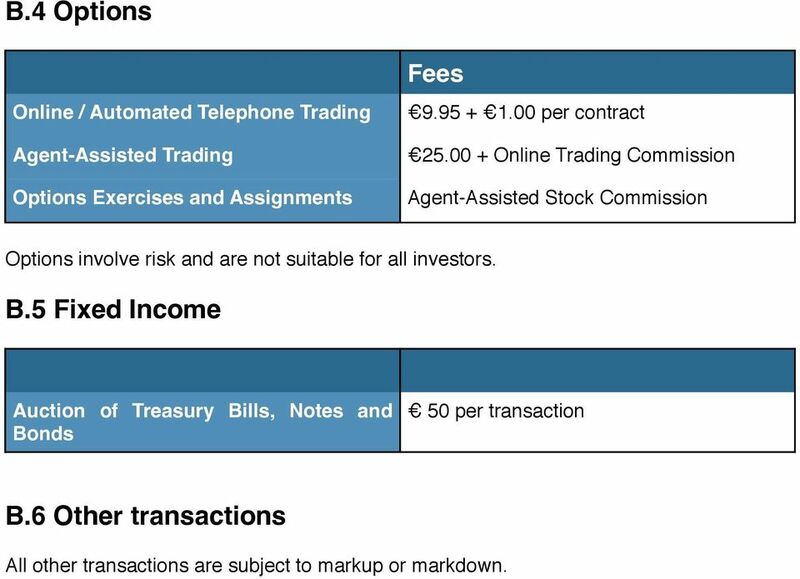 B.3 Funds B.3.1 No-Load No-Transaction Fee (NTF) Funds: Online / Automated Telephone Trading PMA st 100 trades thereafter Greater of or 3.5% of principal PMA Greater of or 2.5% of principal More than 1,200 well-known no-load mutual funds are available without paying a transaction fee to us. Mutual funds available without transaction fees may change at any time without notice. Therefore, any mutual funds purchased without a transaction fee may be subject to a transaction fee for subsequent purchases or upon liquidation. 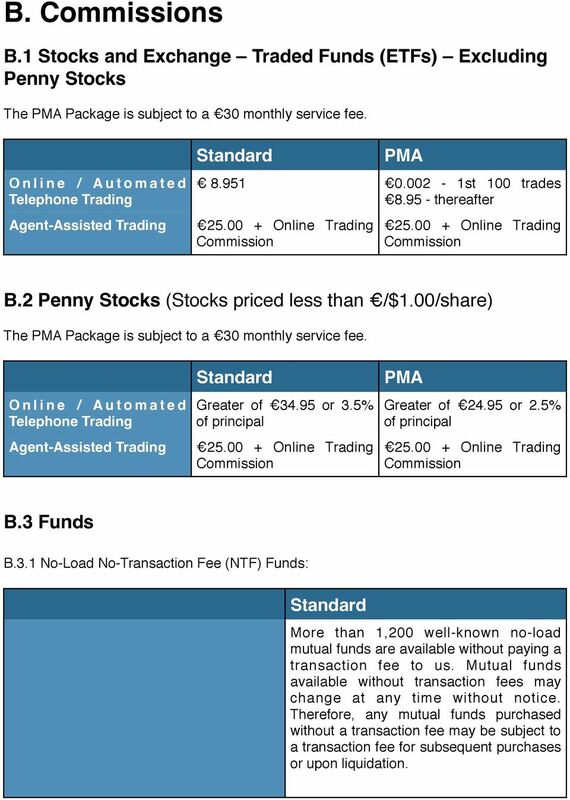 5 B.3.2 No-Load Transaction Fee Funds* The PMA Package is subject to a 30 monthly service fee. PMA Online Trading st 100 trades 8,95 thereafter Transaction fee applies per transaction (buy or sell). You can choose to buy or sell shares directly from the fund itself or its principal underwriter or distributor without paying a fee to us. 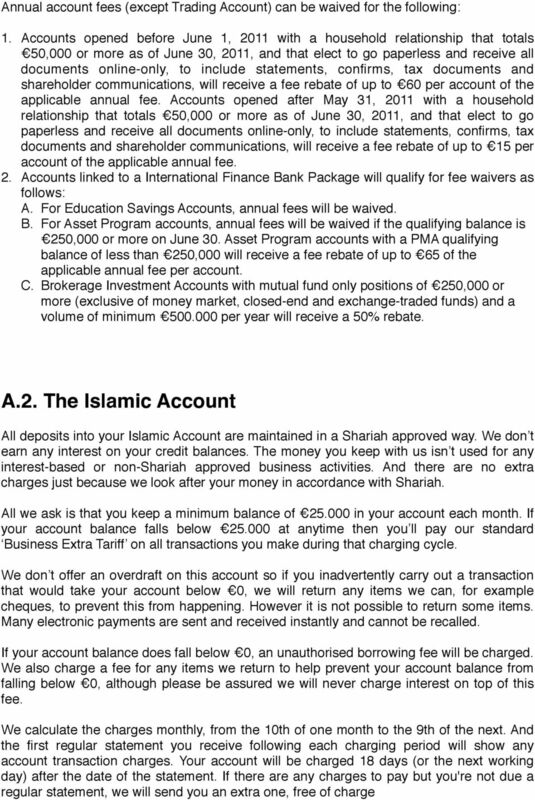 B.3.3 Load Funds: Sales charges apply as described in the fund's prospectus. Please refer to the fund's prospectus for additional information. 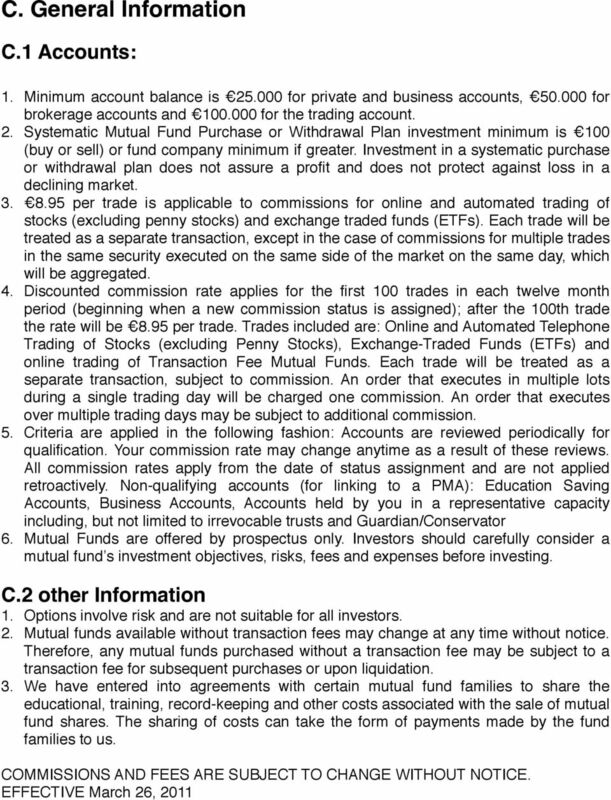 Mutual Funds are offered by prospectus only. Investors should carefully consider a mutual fund s investment objectives, risks, fees and expenses before investing. Please read the prospectus carefully before investing. IFB receives remuneration for providing certain record keeping or shareholder services for some mutual fund families. 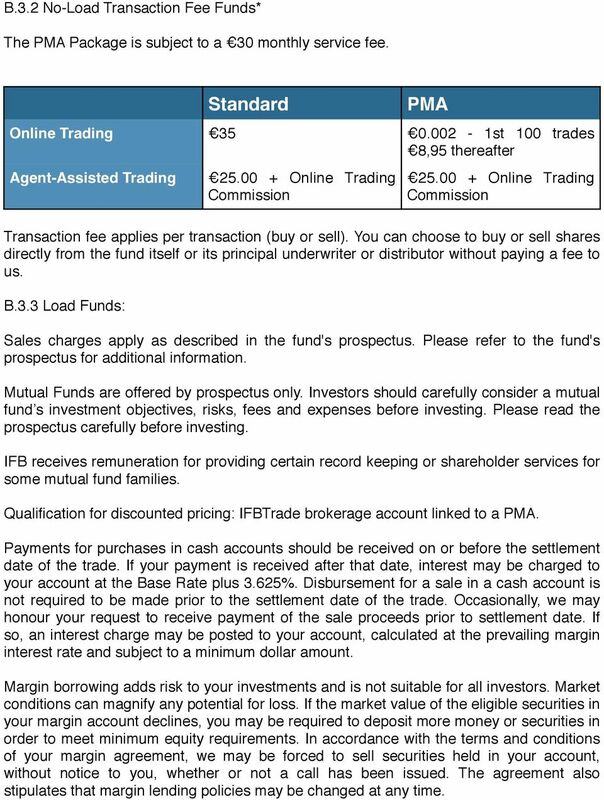 Qualification for discounted pricing: IFBTrade brokerage account linked to a PMA. Payments for purchases in cash accounts should be received on or before the settlement date of the trade. If your payment is received after that date, interest may be charged to your account at the Base Rate plus 3.625%. Disbursement for a sale in a cash account is not required to be made prior to the settlement date of the trade. Occasionally, we may honour your request to receive payment of the sale proceeds prior to settlement date. If so, an interest charge may be posted to your account, calculated at the prevailing margin interest rate and subject to a minimum dollar amount. Margin borrowing adds risk to your investments and is not suitable for all investors. Market conditions can magnify any potential for loss. If the market value of the eligible securities in your margin account declines, you may be required to deposit more money or securities in order to meet minimum equity requirements. In accordance with the terms and conditions of your margin agreement, we may be forced to sell securities held in your account, without notice to you, whether or not a call has been issued. The agreement also stipulates that margin lending policies may be changed at any time. After reading the information in this Welcome Guide, please follow the instructions below to open your SDB account. TD Direct Investing Rates and s 2 February 2015 Our Regular Fees Our management and administration fees are regular account charges that cover the ongoing services you receive from TD Direct Investing.